Several months ago, I was contacted by an editor from Woman’s Day about creating a craft for their Best Ideas for Christmas special issue, and I am so excited to finally be able to share the news with you! I’ve been looking around the grocery store and at craft stores for the issue for a couple of weeks and haven’t spotted it yet, but I received two advance copies of the issue from Woman’s Day in the mail a few days ago, and it should be showing up in stores soon. 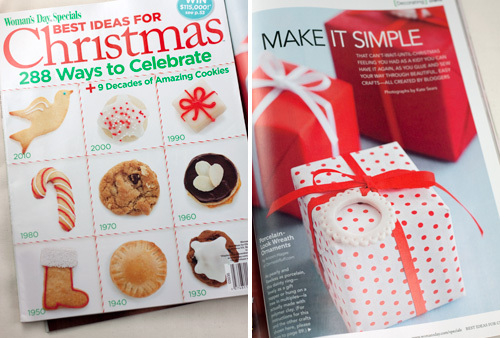 I’m honored to find my project in the company of crafts by Maya*Made, Make and Takes, Chez Beeper Bebe, and Simply Sublime, and it really is a surreal feeling to see my porcelain-look wreath ornaments in print, and in Woman’s Day, no less! About the ornaments — you can find the tutorial in the Best Ideas for Christmas Issue, and they’re really so easy to make. When I came up with the idea, I was able to make several in under an hour and with just one package of polymer clay. Update: Woman’s Day has posted the feature on their website! Check out all of the “Make It Simple” holiday crafts, and learn how to make my porcelain-look wreath ornaments, too. Awesome and congrats. I never buy Woman’s Day but I’ll get this issue. Emily – Oh, I know! I’m the same way, always buying the holiday special issues. Thanks so much, Keila! I appreciate it. Kristen – I saw it at my local Target today! I happened to walk by while the magazine supplier was stocking the shelves and he had *just* put out the holiday special issue! WOW! Looks great in print. Congrats again! Kristen, I just wanted to tell you I saw this, and happily went off to buy some polymer clay. I had seen it in the stores, but never bough any. Usually my son and I work with salt dough. But this looked lovely enough to be worth the investment. We will be rolling and baking today. Thanks for the inspiration. I have been looking everywhere I could think for this magazine… Any hints on where people have found it? My target doesn’t seem to carry it. 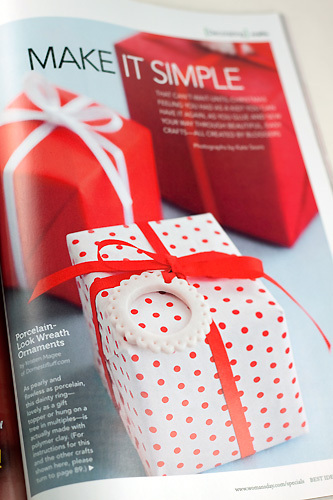 I would really like a print copy because the crafts look so cute – I like having something to flip through. Heather – I’m so happy to hear that you’ll be trying this craft, and I hope you enjoy working with the polymer clay. I’d love to see your results! Julie – I’ve looked for it, too, and can’t seem to find it anywhere. I know someone who found it at the checkout at a convenience store, but I haven’t spotted it at any of my regular haunts (grocery store, Target, etc.). I do hope that you’ll find it because there are a lot of great ideas in the issue.